Unker's Multi-Purpose Therapeutic Rub 13.5 oz. “Your Medicine Cabinet In A Jar” for decades. And it truly is the natural wonder rub-on ointment for all aches and pains, joint and muscle soreness as well as a number of other ailments from burns and bruises to coughs, colds, sore throat and flu. Unker's Multi-Purpose Therapeutic Rub 3.5 oz. 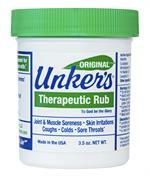 Unker's Multi-Purpose Therapeutic Rub 7 oz. “Your Medicine Cabinet In A Jar” for decades. And it truly is the natural wonder rub-on ointment for all aches and pains, joint and muscle soreness as well as a number of other ailments from burns and bruises to coughs, colds, sore throat and flu. 7 oz.